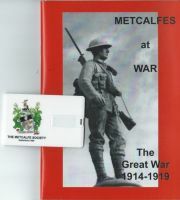 Collected on this site are all the items for sale by The Metcalfe Society. Our product inventory covers research aids, gift items, certificate storage and books (Metcalfe publications as well as various directories and books on CD-Rom). You can also join the Society here or renew your membership. This site uses Paypal for processing credit card payments and please note that you do not have to sign up with Paypal to be able to use this service. However, if you do not wish to pay by this method or do not have a credit card don't worry - simply proceed through the checkout process and on the final screen you will be given the option to print out your order to send to us by post. All proceeds are used by the Society to fund our projects, such as the one currently in development to allow our members to search our archives online, so we hope you find something useful on this website. Also, if there is something you would like to see on this site let us know. Important Note to Metcalfe Society Members - this site is not part of the Members Room and therefore your Society Members Room password will not work. To place an order you must create a new account with the Shop using the Register link at the top of the page.